Scotland Road Trip: "Epic Dunnottar Castle, Aberdeen, and Cairngorms"
Scotland Road Trip: "Our North Coast 500"
Scotland Road Trip: "Isle of Skye and more"
Following this itinerary, you'll get to see a lot of Scotland in a short amount of time. Depending on the time of year and the activities you want to take part in you could stay in certain places longer. There are lots of opportunities for nature hikes and many castles to go inside. During the off-season in the winter, some of the castles may be closed. We really enjoyed our road trip. Since we went in winter there was a limited amount of daylight each day so we had to wake up pretty early to try and make the most of each day. It might be easier to fit in more sights if you make the trip in spring, summer or autumn rather than winter. It was windy, rainy and cold at times but since we were in a car it wasn't too bad at all. Make sure to dress warmly. 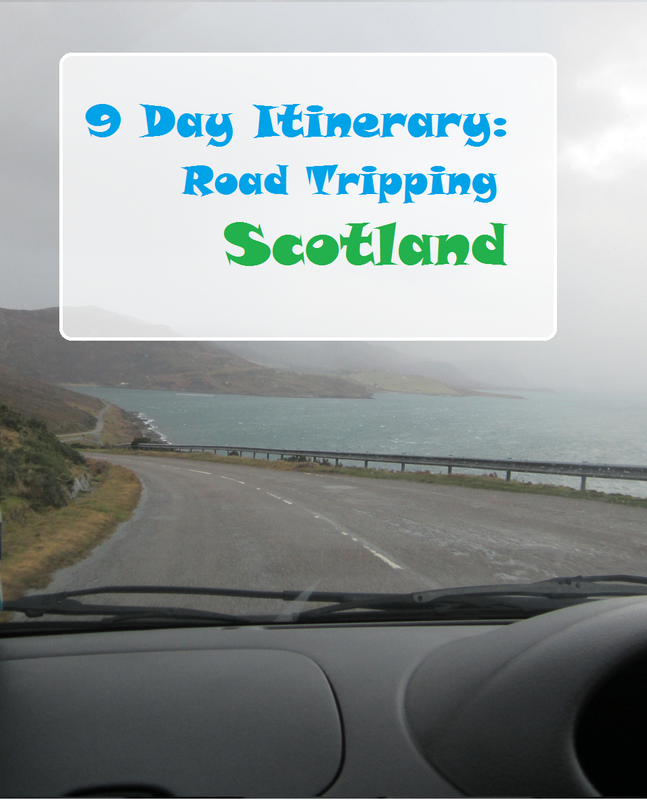 We had an incredible time road tripping around Scotland and we couldn't recommend it enough to people looking for a good road trip. There is so much to see and the scenery will amaze you. Love this itinerary? Pin it for later! When I was in Honduras, I meet this amazing couple from Scotland. The way talk about the beauty of their country was unbelievable. I'm convinced that it's on my bucket list. I can't wait to visit. You just gave me a list awesome itinerary for 2 weeks. Scotland is one of the most beautiful countries we have ever been too. We hope you have an amazing trip. Wow, that's a great way to see a lot of Scotland! Do you have any insider tips? How about tips on renting cars or driving in Scotland? This is a very useful and well designed itinerary. I love Scotland! Is one of my top 10 countries. And the accent, oh the accent. Thanks. We love Scotland too. The accents are amazing. Scotland is on my list and I like that your itinerary includes museums, food, stays, casltes and hiking - all things I'd want to do myself. Saving for later. This is awesome. We're building our Scotland itinerary right now for our trip in April, so we may pull some of these ideas! Awesome! Grab any ideas we want! Scotland is amazing! There is so much to see. Yes, you must get into the highlands! I've only been to Glasgow & Edinburgh. Only heard of Aberdeen in a Joe Strummer song. Since I've seen the two main cities I can probably do this trip in a week or less. Thanks for your advice! No problem! Hope you get on the road soon! I love how you guys laid this out as a straight-up list itinerary! Super convenient to save other travelers on having to plan. I flagged the Cow Shed as a possible place to stay (love this kind of lodging). Do you guys have any idea if it's possible (allowed?) to kayak Loch Ness? We travel with our own and I've always wanted to kayak the lake. The Cow Shed was pretty unique and a fun addition to our trip. I'm pretty sure you can kayak it, you can also kayak Loch Lomond. I am guessing 9 days should be sufficient to keep aside for road trip across Scotland. I have a dream to see as many castles as possible there. The best part is you have grouped it in days, that makes planning much easier. There is a castle in almost every stop if you want it! What a great adventure! Nothing beats a road trip. You have all the time and places to explore at your disposal. Have done more than a couple of road trips before and considering doing more in the future. Been to Edinburgh, Glasgow and Scottish Borders and need to see more of Scotland. It was great. This was our second road trip around Scotland. We love traveling in Scotland. The beautiful castles and the amazing stories. The Eilean Donal castle is so picturesque. Do you see the Fairy Flag too? No we didn't. Dunvegan Castle was closed when we went. I am happy to see that you've included in your itinerary the Isle of Sky. It's one of my dreams to go there but it's so far away and I don't drive. I would love to visit the castles in Scotland as well because when I was little my parents used to have a painting of one in their bedroom and I always wondered how it would be to be there, in that wilderness. Isle of Skye is awesome! So relaxing. We hope you get there one day. Do you know which Castle? I simply love road trips. And one in Scotland is my dream. The landscape is simply breathtaking.The best part of road trip is the surprises you get with each turn. You have covered it quite well.I loved the way you made these small videos. The videos were pretty fun to make. Glad you enjoyed them. I went to University in Edinburgh for 4 years and I'm ashamed to say I never went to the Highlands or the Islands. I spent one day in Glasgow and that was it. Too busy partying and now I regret it so badly. Your videos show the absolute beauty that is this amazing country and I'm determined to get back there and do it properly soon! Sorry to hear, but it sounds like you had a great time in University! We hope you make it back there soon and explore! Glad to hear you enjoyed the videos and our itinerary! Road trip always attract me. I hope one day I'll do the same. Hope you get there one day. Ah, I keep seeing Groupon Getaways for Scotland. I have been dying to go and especially to take a road trip! I feel like every place I go I want to take a road trip haha. I will bookmark for future when I actually make it there! Road trips are amazing. Can't wait to get on our next one. This really does look like such a great trip. Glad you enjoyed it and hope to do one like it myself, one day! Scotland is one of those places I just can't wait to get to. I have a whole trip planned to the UK where we road trip around for a couple of months. Not sure exactly when we are going to do this, but this blog post has given me almost a perfect itinerary for the Scotland leg of our trip. Thank you. Awesome! You are welcome. Have an amazing time. Eilean Donan should be in there somewhere. Very touristy, but well worth a visit. And, of course, the superb photo opportunities. I've been there twice and I'll be back. Thoroughly agree with the north and west coasts. Some of the best scenery on the planet. And some of the friendliest, cosiest places to stay. One of the great road trips, and you're talking to a Route 66 fan here! We did stop at Eilean Donan, but we didn't include it on our main itinerary. It was a lovely castle, but not one of our favourites! We also hope to do Route 66 soon! Awesome! Hope you have a great time! Thank you. You will love Scotland! Especially in the summer, you will get some amazing photos. Have fun! Scotland is amazing! You should definitely go!